Faith is gut level stuff full of twists and turns, stories of wonder, valleys of frustration, holy relationships, and awkward fits and starts. Sometimes the best way to express faith is to speak to these realities but few seem to be allowed to express what is going on in the deepest levels of ourselves. Somehow, in our modern context, faith that doesn’t have a chrome like luster to it isn’t considered faith at all. But I have always been drawn to writers, singer/songwriters, and artists that acknowledge that faith has a heart and soul component that has to be addressed if we are to love the Lord our God with all of our heart, soul, mind, and strength. But these kind of artists are hard to find. Sure, there are no shortage of devotional thoughts and email forwards that tug at our heartstrings. What I am talking about is not just found in our “chicken soup for the soul” moments but in our everyday midst of life moments. Frederick Buechner was that first one that I read that seem to infuse his writings with the absurdities of life, not for absurdities sake but because, if you haven’t figured out, absurdities are a fact of life, even for the Christian. Absurdities, but also pain, doubt, hope, frustration, soured relationships, grace, and love. I say all of this to point out how refreshing it was to begin reading two books at the same time that express life and faith, not in the neatly packaged way of most Christian authors, but in what I seem to experience myself. First, I began reading Francis Spufford’s Unapologetic and couldn’t really believe that a book like this could actually be written in 2014. It is so gut level and raw that I would only reccomend it to certain people. His writing style is so pressed down that you wonder if he will ever come back up. Yet, his emotional case for Christianity is so compelling yet simple it is a wonder its message isn’t more wide spread. Just his HPtFtU (I will let you look it up) concept is worth the price of the book. Spufford’s writing is so profound because he touches on aspects of our lives that we all can identify. Have you ever felt guilt? Have you ever had a sense of God’s presence? Have you ever wondered how on earth things that are ruined can ever be made right? Have you ever thought Jesus might actually be saving you from something beyond Hell? 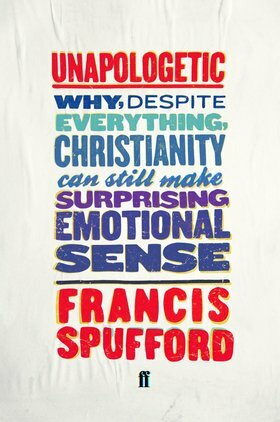 Readers weaned on Piper, Sproul, and Blackaby won’t get Spufford but if you need to be punched in the gut more than you need your intellect massaged or your religious app updated, Spufford will do the trick.